WASHINGTON -- U.S. Sen. John McCain says doctors have given him a "very poor prognosis" as he battles brain cancer. 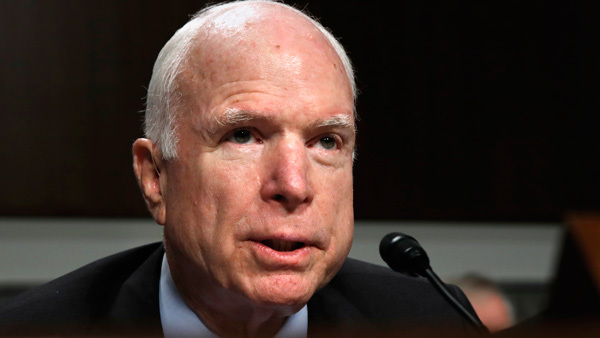 McCain underwent surgery in July for a brain tumor that was later found to be a form of glioblastoma, the same type of cancer that took the life of his former Senate colleague Edward M. Kennedy in 2009. McCain tells CBS' "60 Minutes" in an interview that aired Sunday night that he thinks about Kennedy a lot. He says Kennedy continued to work despite the diagnosis and "never gave up because he loved the engagement." McCain says he has "feelings sometimes of fear of what happens," but counters that with gratitude for having lived "had a great life." He adds: "it's not that you're leaving, it's that you - that you stayed."